After going to dinner with Liz at Cafe Bernardo to do some trip planning, Sharon and I watched O.J. : Made in America, Episode 3. This is the third episode of a five part ten hour miniseries. 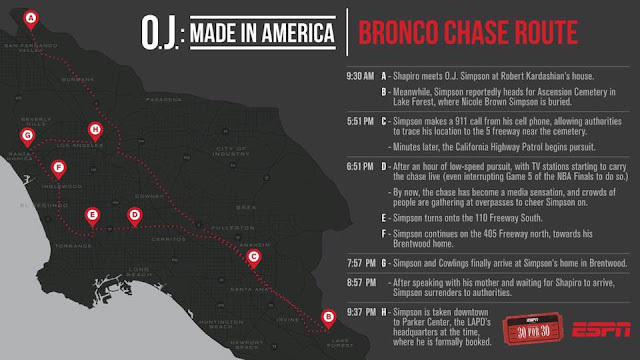 The miniseries explores O.J. 's life as well as race relations and the cult of celebrity. This is the tenth installment of ESPN's 30 for 30 Volume 3 and the first episodic ESPN 30 for 30 documentary. An episode guide for Vol 3 is here. Sharon and I are both looking forward to the next two episodes. This is a very well done documentary.